Many casino players love playing roulette. Roulette can be fun and enticing once new players learn how to play it and win for the first time. As they find a new hobby, some players are attracted to winning more and find out some tricks or if possible, a system to win roulette more frequently. This is why numerous roulette books have been launched in the market to serve as guide for beginners and make the experts more skilled. Games of chance, such as that ones played at casinos, are called such because most people believe that the chance of winning is merely based on luck. But some experts believe that these games are based on mathematical statistics, and a real wheel used in roulette is not perfect and the winning numbers can be predicted sometimes. Still online roulette is measured and calculated perfectly and it works under a random number generator system. As you search for roulette books at the web, you will be surprised to find out that a lot of books are dedicated to the ways of winning at roulette. Some were written by professional gamblers themselves, others were made by using legit rules while a few offer cheats. Roulette is still considered to be a game of chance, but according to some authors, there is a system to beat the game and take a little more control. 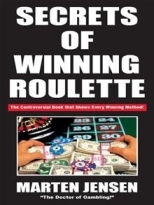 Marten Jensen is famous gambling author, who wrote “Secrets of Winning Roulette.” This book boasts about the best strategies in winning the game and increasing the chances to make a profit. It is recommendable to both beginners and experts. Inquisitive players must be ready to note down the tips before they play online or at the traditional casino. The author is even considered to be the “Doctor of Gambling.” He is one of the trusted people to consult when it comes to gambling techniques, and he is known all over the world. His famous book about roulette is easy to understand, and it is the best tool for players who have decided to master their skills of roulette playing. Beginners who just want to learn about the basic rules can find it useful, while those who want to become an expert will surely be interested at the techniques the author suggests. Another one of the top roulette books is “Get the Edge at Roulette”. It is written by Christopher Pawlicki, an expert gambler who was coined as the “Spin Doctor”. He is really experienced roulette player; and many gamblers are amazed how exquisite he can beat the wheel. It was said that his mathematical knowledge led him to learn tricks the roulette system. In his book, he provides players with a powerful tool by telling a step by step guide on beating the wheel. He also teaches readers on how they can get to know if a wheel is biased or not, in order to win the roulette in a little bit cheating way. The book presents ideas in form of diagrams and mathematical calculations that are very helpful for playing and understanding game mechanism. These two roulette books promise readers to increase their winning chance and any player can boost his/her chances to win using these books.